In the following post you’re going to learn about 20 of the top SEO plugins for WordPress. These plugins will help you take care of things like on page/technical SEO, redirects, XML sitemaps, link building, rank checking and much more. WordPress is the fastest growing and now most widely used content management system (CMS) available today but why is it so popular? This is partly due to the fact that you can do so much with WordPress that it allows users who have no coding experience to do some truly great things that would take a huge amount of time and effort without the use of a CMS. On a personal level, I am a WordPress fanatic, I’m not a developer or programmer but I have been tinkering about building websites for a good while now, all of which happen to use WordPress because it’s so flexible. There are a lot of different aspects to the building of a website where the SEO is concerned so I have put together a list of 20 free SEO plugins for WordPress. While off page factors still account for the majority of Google’s ranking algorithm these plugins will give you a huge head start and give you some quick wins. This is an extremely powerful and well coded plugin that was created by Joost de Valk whom is not only a web developer but also knows his stuff when it comes to SEO too. WordPress SEO by Yoast is compatible upto WordPress 3.5.1 and is regularly updated with fixes and extra functionality – I’m surprised this plugin is free considering all that it can do. Some of the features include – snippet previews, page analysis, technical tweaks, control over meta data, XML sitemaps, RSS optimisation, breadcrumbs and social integration with the Facebook OpenGraph, Twitter card meta data and more. If this is a WordPress SEO plugin that you haven’t taken for a spin yet then now is the time. This plugin has been at the top for a good while and now has over 13.7 million downloads which is an insane number. Some of the features include – control over meta data, support for custom post types, canonical URLs, Google Analytics support and advanced indexation controls. There’s also an option to upgrade to a pro version with some great extended features. If you’re an All in One SEO Pack user there may be an occasion where you wish to add titles and meta data to your category pages for example with an eCommerce store or if you have a theme that pulls in category descriptions for example. 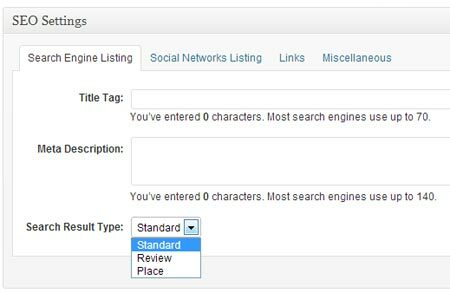 Unfortunately this isn’t possible with All in One SEO Pack but this plugin will extend the functionality so you can add category meta data should you need it. This is another extension for the All in One SEO Pack WordPress plugin that will allow the dialogue box that is displayed when you add posts or pages to be displayed for product post types within WooCommerce. Note: you will also need the WooCommerce plugin to use this plugin as well as All in One SEO Pack. This SEO plugin isn’t as extensive as something like the WordPress SEO plugin by Yoast but if you’re looking for a straight forward plugin to manage your meta data then this is it. There’s also support for Google Analytics, Google Webmaster tools, CrazyEgg heat map, HitTail and a number of other tracking tools. SEO Ultimate is another very complete SEO solution for WordPress that is packed with features, what’s great to see is the continued development of this plugin and the developers have continued to add new functionality in line with current trends within the industry such as rich snippets, OpenGraph, Twitter Cards and more. SEO Ultimate will also take care of all of your meta data, 404 error monitoring, Google Plus authorship, URL canonicalization and much more. This is a great no frills plugin for the important SEO essentials such as meta data, robots, descriptions, titles and canonical URLs etc. Greg’s High Performance SEO allows you to configure your meta data for a variety of post types including your home page, posts, pages, tag/author/category archives, search results and 404 pages along with paged comments should you need modify them. Redirection is a great solution for managing the redirects on your site; you can add redirects manually or you can upload a CSV file. Whether you’re moving a site to a new domain or host or just tidying up any 404 errors then you’ll find this plugin very useful. Sure you could just edit your .htaccess file but this is a great plugin for those that aren’t comfortable messing around with any code. Social signals are a big deal and they’re going to become even more of a big deal in the future, so it’s important that you don’t skip past this plugin just because it’s quite new. WP Social SEO Booster works alongside other SEO plugins (such as WordPress SEO by Yoast) to provide you with a powerful solution to display rich snippets (such as reviews, products, business, people, recipes, software, videos and events), incorporate Google authorship, Facebook OpenGraph, and Twitter card tags. Creating XML sitemaps is extremely important because they allow search engines to see all of the pages or posts on your site that are available for crawling. They also incorporate other data that will show search engines which pages are priorities and how often pages are updated so search engine crawlers will know when to come back and take another look at the page. There are a lot of tools you can use for this, but this plugin is the most straight forward option because it’s as simple as installing, activating and clicking the build button. Google XML Sitemaps has a lot of additional features including; notifications to Google and Bing, adding sitemap URL to your robots.txt file, rebuilding sitemap when content is updated along with settings allowing you to choose which post types to include in your sitemap and display priorities of post types and update frequencies to search engine crawlers. You can go a step further and import your sitemap into your Google Webmaster account and Bing Webmaster account directly. This should be an essential plugin in your SEO toolkit. As you can tell from the name, this plugin will generate you an XML sitemap for the videos embedded on your website. The only drawback I can see here is the limitation I can see here is there is no mention of pulling in videos that use video sharing websites other than YouTube. Despite the limitation, this is a handy little plugin. If your website or blog uses a responsive layout that resizes automatically to fit various devices and monitor sizes then you won’t need this plugin, however if you have a mobile site that is completely different to your main website then you will find this plugin incredibly useful. This is a great way of letting search engines know about your mobile website but it’s also recommended that you add canonical tags on your mobile pages so that there is no chance of having any duplicate content issues. Another handy XML sitemap generating plugin for you here that will build a sitemap for you that contains links to all of the images you’ve got attached to posts or pages on your website. There’s not much to it, install, activate and click generate and the sitemap will be built for you. This plugin was created by Vladimir Prelovac who has created some great plugins and even browser add-ons in the past. SEO Friendly Images is a really straight forward plugin that will add title and alt attributes to all of the images on your site. You can choose exactly what piece of data you want to pull in to form the alt tags and title tags. 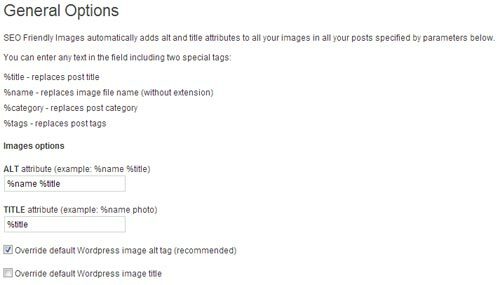 You can choose to use the post title, image file name, category or tags and you can also use any combination of these to give some well varied alternate/title tags. This is an extremely useful SEO plugin for local businesses or agencies/individuals that work with local businesses. With a few clicks you can populate an entire contact page with your business name, address, opening hours, phone number, payment methods, links to social profiles, embeddable Google Maps. This plugin also supports rich snippets and gives you the option to use customisable QR codes. This is HUGE time saver. When you’ve got a lot of posts on your site it can be difficult to identify opportunities for improving your content. The end goal is to get more traffic to your site by making your site more visible in search but where do you start when you’ve got a lot of posts? This plugin allows you to easily find the posts on your site where you’ll be able to get quick wins by adding to existing content and tidying things up. The problem with SEO meta data within WordPress is that it can be quite easy to lose that data when you swap plugins or themes. Some plugins like WordPress SEO by Yoast come with some powerful import/export features and other plugins like All in One SEO (the free version) can lock in your data giving you no room to export which is a nightmare. This plugin allows you to easily transport data between plugins and theme frame works (a lot of theme frameworks will have internal SEO options so you don’t always need a plugin). Imagine if you had no coding experience and had to migrate data on a 500 page website by hand – ouch! In order to understand what’s going on with your website, its traffic and also how visitors interact with the website you need a comprehensive set of analytics data. There a lot of different alternatives but Google Analytics is powerful, free and easy to setup so is a common choice for most. The only thing is that you need to tracking code to each of your pages to make this work, this is easy to do with certain themes but outside of that you might end up having to edit some code – if that’s not something you’re comfortable with then this plugin is a great option for you. Setup is simple, just add your tracking ID, select enable and you’re off. One of my favourite features that is included with this plugin is ability to exclude logged in users from your Google Analytics data, you can choose to exclude based on different roles too. There are a lot of additional features for you to get more out of this plugin including outbound link tracking, download link tracking, dashboard website, site speed tracking and more. I love the idea behind this plugin because from an outreach perspective it’s a great way to build a list of contacts that know who you, fast. The Comment Contact Exporter will export your data to a CSV file and will include email addresses, URLs and names of commenters. You can also connect to the SEOMoz API to pull in domain metrics which will make organising the contacts you’ve exported very straight forward. I personally feel that monitoring rankings within search engines is becoming less and less valuable as time goes on due to the number of personalisation factors within Google. It’s gotten to the point where just searching in a different browser can alter the results that you find slightly. Despite that, tracking rankings is still a great way of getting an overall picture of what’s going on and can highlight potential issues. Just add your keywords and you’re ready to go, SEO Rank Reporter will update your rankings every 3 days and display them in a graph and table layout. You can also see start dates, rankings at start, current rank and change in rankings. You will also be able to see how many visits you’re getting from the different keywords but this feature will become less and less useful as the rate of the dreaded “not provided” keywords increases. Note: If you manage client websites or you wish to track a large number of keywords you may be best off looking at an online rank tracking tool instead of this plugin. There you have it, 20 of the top free SEO plugins for WordPress, plenty for you to be trying out and testing. Remember that you don’t need all of these plugins, every website installation is slightly different, some plugins you may need because they give you features that you don’t have with a WordPress theme and others you may need because a theme is lacking. Use as much as you need, but don’t fill up your site with plugins that don’t add any real value to your site or help towards accomplishing the goals of your website. If you feel you need to use schema markup then do your research and find a good plugin that adds value and keep your site streamline. What I’m trying to say is, be selective. 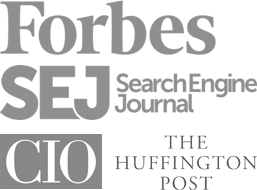 Which SEO related plugins are using right now on your WordPress based site? Let us know in the comments below.